From the highs and lows, with a recurring theme of Man United and tough emotions shared with Jurgen Klopp, Xherdan Shaqiri has endured the hard miles. Saturday, May 5, 2018. A fine, sunny day in the midlands as Xherdan Shaqiri casts his head to the skies. Hands perched on his hips, a long-resigned expulsion of a sigh. An 86th-minute goal from Crystal Palace’s Patrick van Aanholt had condemned Stoke City to the Championship, and the cold, hard realisation began to sink in for a player who was once touted as one of European football’s most dazzling prospects. 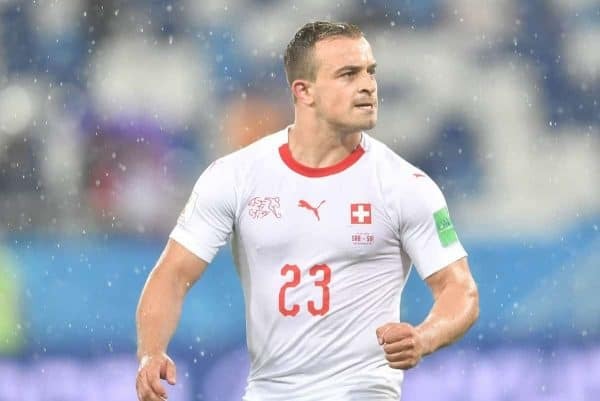 Shaqiri’s 43rd-minute opener had been—as the player himself always was for his former employers—a solitary ray of hope in otherwise cloudy times. As summer rolled around the Swiss playmaker—still just 26 years old—quickly became a man with little time to waste. What, with the World Cup fast approaching and a contractual lifeline meaning he could depart the Potteries in a cut-price deal, the correct decision had to be made. Not short of suitors—eager to capture a Champions League winner at a £13 million snip—Shaqiri placed trust in his management company ESHA and jetted off to Switzerland to be with loved ones, before also making a detour to Kosovo; a place of which his duel heritage caused much angst during the World Cup clash with Serbia. 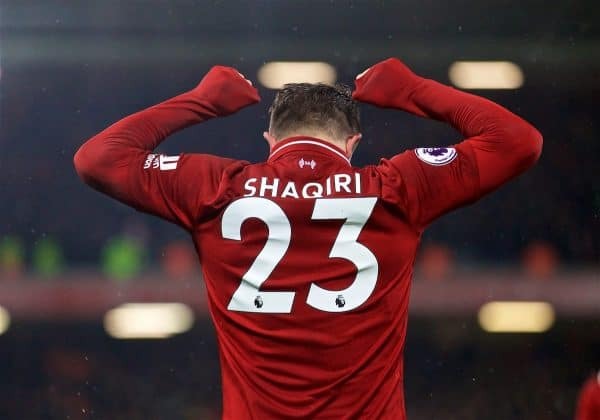 The high-low juxtaposition of heady European nights and Premier League relegation left the Shaqiri party with a quandary: place their client with suitors who would again front him as the jewel of the crown, or elbow their way back onto the main stage with the elite. Liverpool came calling—defeated Champions League finalists eager to dwell little on licking their wounds but instead sit again at the top table—and the competitor in Shaqiri was never set to back down. Would things have been different had the player not had the fortunate reprieve of a financial get-out? How much would Shaqiri have cost in an ever-growing market stretching from the questionable to the absurd? Three seasons of Premier League football under his belt, with a showreel of double-take goals and a steadily growing reputation could well have made the Swiss international a £30 million player, perhaps dissuading the likes of elite buyers who, for an extra £20 million, would invest in a ‘guaranteed superstar’. Football is a funny old world right now. Still, for Shaqiri none of it mattered. The deal done, Klopp bear hug received and a plane ticket stamped for New York—it was time to head off on pre-season and start proving a point. Yet again. Footballers live fortunate, privileged lifestyles, with perks like none of us can ever imagine. It must, however, take some doing to be spoken about in ever-glowing terms throughout a burgeoning career—yet still not be considered quite good enough. With the classic adage of the ‘Swiss Messi’ daubed on him at Basel, Shaqiri tortured United in December 2011 in the Champions League group stage. A roadrunner of a performance, harassing, outmuscling and dazzling in equal measure saw the then-20-year-old provide two assists as United were downed 2-1 and exposed as a penetrable vessel. It was this performance, and others of similar pedigree that season, which saw the new alpha males of the European landscape, Bayern Munich, secure his signature. German football was all the rage, continentally and internationally, and Bayern were intent on polishing this unearthed diamond for their own decorative purpose. King of the jungle status was achieved in the 2012/13 season, when Bayern faces reflected back in the gleaming silver front of the Champions League trophy upon the Wembley Stadium turf. The all-German affair left Borussia Dortmund heartbroken and Das Reboot complete. Bayern conquered, yet did so without their recent addition. Shaqiri sat, impatiently, on the bench for 90 minutes plus added time. In alternating stages between fiddling with the hem of his fluorescent warm-up bib, and heading out onto the touchline yet again to keep the blood flowing, Shaqiri must have pondered how the stars had aligned in this way. The biggest game in club football, yet the most numb of feelings. And so the journey—which already had taken him from the city of Gjilan in the Kosovan valley region of Anamorava to the dizzying heights of Bayern—had, in fact, only just begun. It’s testament to the man himself then that the following years would include another glamour move to Inter Milan—where fervent supporters mobbed him at Malpensa airport, desperate for a spark to reignite their sleeping giant of a football club—to the grey ashen colour palette of Stoke-on-Trent. The old quip of Lionel Messi having never endured a cold, Tuesday night in Stoke has well since ran its course. But Shaqiri did, however, tick this box over and over again. Succeeding in a team where many of Barcelona’s famed La Masia graduates came, and failed, to have a solid crack of the whip. Those hard miles were banked. 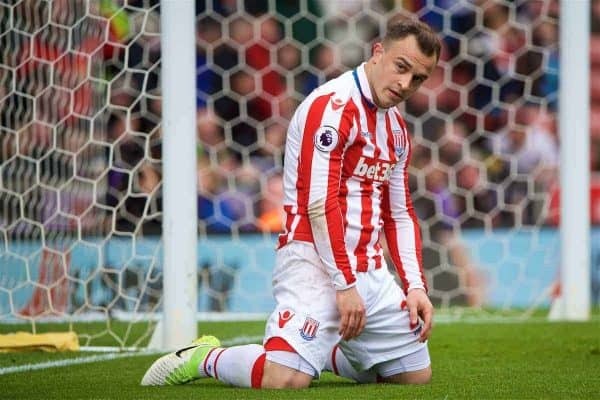 Shaqiri brought vivid colour to the Potteries season upon season, yet still came under questioning from none other than the expert opinion of Charlie Adam upon the ship finally passing beneath the waves. 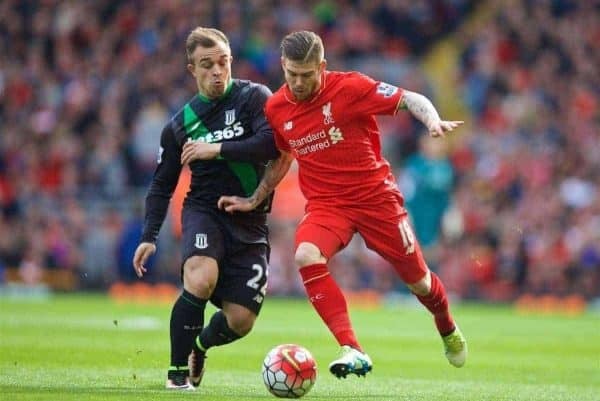 Stoke’s relegation prompted Adam to question Shaqiri’s dedication to the cause. Fans bemoaned his ‘non-existent work rate’ and scoffed at the optimism of Liverpool supporters who believed Michael Edwards had brought on board a minimal-risk passenger. Gary Neville too, of course, would get in on the act. During his role as a World Cup pundit the United legend would label Shaqiri ‘unprofessional’ and not the sort of player one would desire in an ambitious team. Idle, throwaway comments built on little substance such as these bled nicely into the narrative of a player on the move. Adam’s words allowed others to echo the view of a Stoke insider, without much considering the reality of having an elite-level player within the ranks of a club lost in its ways, heading for the abyss. Shaqiri’s mercurial spark lent much to the fact he would often be found up front, waiting for the ball in order to spin on the last man and hustle something from the game. Stoke players later admitted former boss Paul Lambert would urge, in his team talks, for the ball to be fired in the way of their No. 22 at any opportunity. “I don’t come from the richest family, so it’s nice to see the people who are behind me. “My parents, they were always hard working. Still, United stalwart Neville had his say and stoked nicely the flames of resentment between his former club and their bitter rivals. But here’s where United truly show themselves to have that special, reoccurring connection for Shaqiri. The omnipresent participant, lurking in the shadows. From that European masterclass which first made Shaqiri’s name, to his Liverpool debut. United were back again and the diminutive star would seize the bull by the horns and ride it into the sunset. Hot on the lips of fans were questions of whether Shaqiri could have any vague hope of ousting the likes of Mo Salah, Roberto Firmino or Sadio Mane. For the odd cup game, perhaps? Or would a midfield three which plundered to Kyiv, in fact, allow him any look-in? 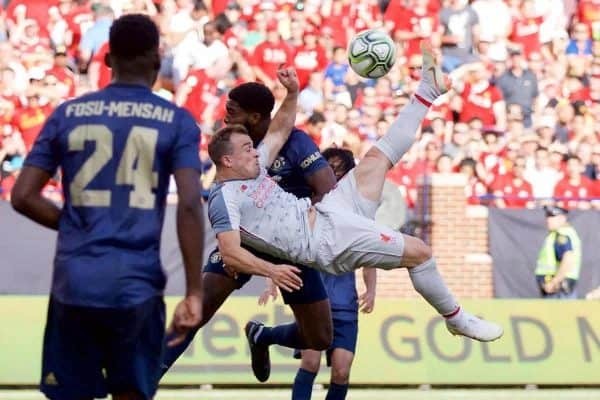 In response to these, and a series of other nagging questions and jibes of the preceding months, Shaqiri launched himself through the humid, Michigan air to execute a pristine bicycle kick and left highly rated United youngster Ro-Shaun Williams clasping nothingness and rubbing his eyes in disbelief. Perfect connection, perfect response. A man on a mission. From there, what has been observed since is nothing short of special, and still a work-in-progress. Shaqiri’s ability has never been in question for Liverpool fans, but his capability to adhere to the blueprint on Merseyside was the overbearing wonder. Bedding himself into the Melwood ecosystem, Shaqiri quickly became a popular figure amongst staff and team-mates alike. Around the training complex he’s affectionately known as ‘Big Shaq’, and had this freshly adopted nickname boomed down the tunnel by Virgil van Dijk following the final whistle last Sunday. Grit, determination and a strong willing to adapt has seen the former Stoke man become the most desired of headaches for Klopp. The on-pitch ‘spat’ between the two following the Carabao Cup exit to Chelsea was testament to two sportsmen desperate to teach, learn and develop. Shaqiri knuckled down furthermore and slowly permeated into something of a Liverpool regular. His five goals from 13 Premier League games (more than half substitute appearances) with two assists, stands up with some of the best in the division. Every 69 minutes Shaqiri now contributes a goal or assist compared, say, to Eden Hazard’s 72. Still, it would take the old rekindling with United to align destiny on the correct course once again. 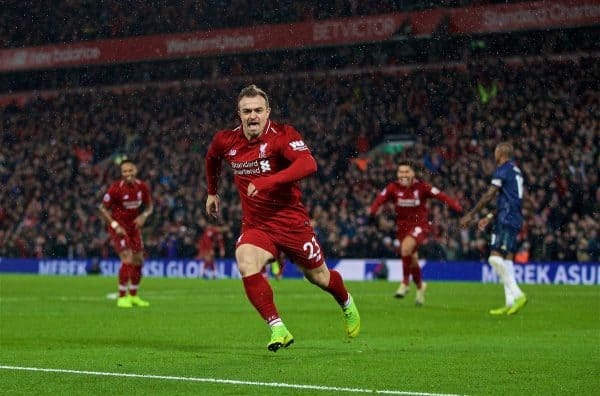 Sunday’s Anfield showdown not only brought the curtain down on the Jose Mourinho era, but also spotlighted Shaqiri as the man for the main stage, with the pressure at an all-time high. 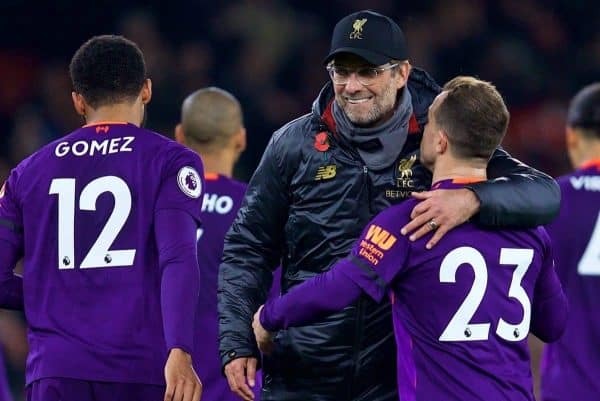 Two deflected goals moulded Liverpool’s dominance into a tangible scoreline drubbing, and fired shots at the naysayers who feel the Reds must use the upcoming January window to hastily bring in a creative spark. Shaqiri’s impact was so masterful in its approach purely because United did not know how to deal with his ever-moving and artfully nondescript presence, in a game which was rapidly getting beyond their reach. Liverpool have lacked a Philippe Coutinho figure since the talented Brazilian left for Catalonia, but in Shaqiri they have a differing, mesmeric presence which offers an alternative brand of flair with power. The haste to wrap the deal up in summer was no coincidence, with contact being made with the player before departure to the World Cup. And now, Liverpool must go on. The fear of losing a game, or even dropping points, remains. Shaqiri’s form however is one of the many, many positives for Klopp right now. Talent is banging at his door for a starting place—something the Reds have yearned for year upon year. During that cold, Wembley night in May 2013, Shaqiri’s mixed feelings of Champions League glory with zero input must have been difficult to comprehend. Had he looked across to the opposition dugout—and perhaps he did—a defeated and disconsolate Klopp would have been staring back. Both men left the stadium that night feeling something in their career was missing. They are, for now, on course to go about filling that void together.